This may be my favorite part of the story, which you'll learn why later. At the time it didn't seem quite as significant, but when it was all said and done, there is no way you can question the sovereignty of GOD in orchestrating my marriage. At some point in April, my best friend from elementary school, Sharon, called to tell me that she and her husband had decided to renew their vows in the upcoming summer. They had eloped right after high school, so they never had a wedding ceremony with their family and friends and they really wanted to do that. She asked if I would be her maid of honor and I was so excited to get share in this opportunity with her! Since she lived in Texas, there was no possible way for us to go dress shopping together. With me being her only attendant I wouldn't have to worry about matching anyone so she told to find a dress, any dress I wanted, just make sure it was lilac. Somehow, I convinced Earl to go dress shopping with me one day. We headed off to Wedding Wonderland and I tried on several dresses before settling on a simple, long A-line, satin dress with a darted waist and a minimal amount of beading around the neckline. They told me the dress would have to be ordered and that I would need to come in for a fitting sometime around May. May would not only bring my new dress, but an end to my fast. I was excited and sad at the same time. After all it had been 40 days since a single morsel of food had touched my lips, so I could not wait to eat. However, at the same time, I was scared of losing the oneness I'd experienced with GOD. This encounter was so life changing, but not only that, I was left in holding pattern. I mean, I now had the joy that I had so longingly desired, but I wasn't free to move forward, which was something else I was hoping for. I knew GOD was still asking me to wait, just a little longer. A couple of weeks into the month Wedding Wonderland called to let me know my dress was in and schedule me for a fitting. I picked a date and Jerrie accompanied me to shop. When we got there, the attendant brought the dress out and I tried it on. It need to be taken in slightly since I'd lost a few pounds from fasting. Once they did all their pinning and tucking, Jerrie suggested I try on wedding dresses just for fun. I figured it couldn't hurt. It would be amusing to pretend my big day was just around the corner and prance around in all these lovely gowns. We picked a few to try on and the attendant helped me put on dress after dress. I remember thinking, they were all so beautiful, how could any bride pick one for her special day. I was almost done with the dresses we had picked when I slid my body into it. It was perhaps one of the most simple gowns I had adorned that day. It was a long, white, princess cut dress with the most beautifully understated detailing I'd ever seen. 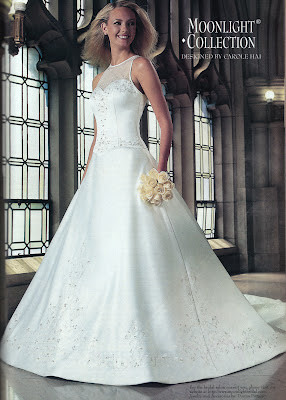 It used a mixture of swirls and tiny flowers with rhinestones in the center sparingly up the bodice and around the waist. 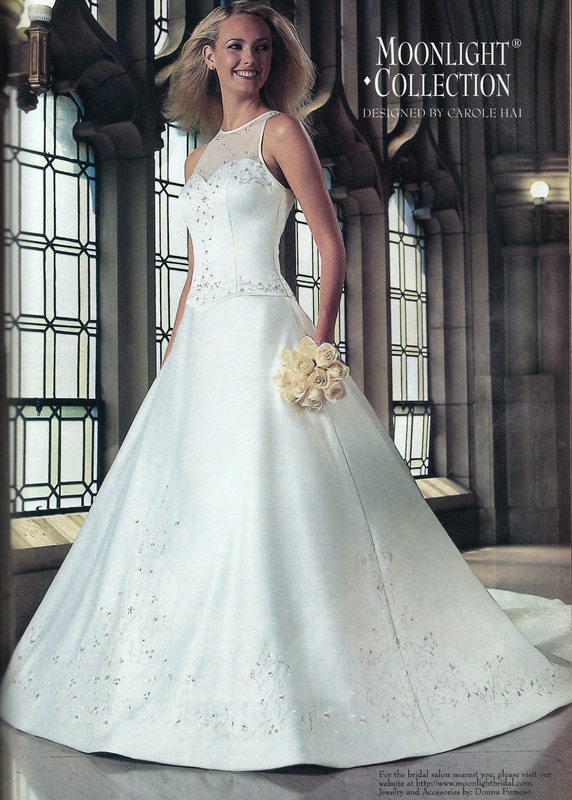 At the top a lace overlay came down to meet the heart shaped satin neckline. The bottom of the gown had the same detailing on the front and train. However, my favorite part was the back. It was so unbelievably exquisite and elegant. There was long line of tiny buttons extending down the back to the waist. Everything about it beckoned me to chose this dress to wear on my wedding day. I emerged from behind the dressing room doors, stepped up onto the platform with the mirrors surrounding me. And instantly I gasped, as did Jerrie. This was it! This was MY wedding dress. I knew it. Jerrie knew it. Even the attendant knew it. I stood there in awe, completely flabbergasted. A million thoughts swept through my mind, but especially ones reminding me that I didn't have a ring, a promise, or even someone to call my boyfriend. I had no indication from Earl we were even headed in that direction, with the exception of him asking me to wait on him to figure things out 3 months earlier. That was it. Here I stood in the most stunning gown I'd ever seen with nothing but a pipe dream. The attendant asked what we wanted to do and we told her to give a us a few minutes, so she graciously walked away leaving us alone. I looked at Jerrie and she looked at me. In that moment, I think Jerrie knew this wedding was going to happen at some point. She spoke first, "Rock, this is your dress. This is you. What are we going to do?" I answered in an uneasy tone, "I don't know. I mean I don't have a ring. Earl hasn't even said he's interested in ever marrying me. I just don't know." With more resolve than, I believe my dear future mother in law has ever had, she said, "Go pray about it." So off I went into the dressing room. As I stood there, I uttered up a prayer to the GOD I'd spent so much time getting to know recently, "LORD, I know all of this has been a roller coaster. I know my faith is as fickle as Earl some days, but I know this is my wedding dress and I know Earl is the man that YOU have ordained for me to spend my life with. Please show me what to do." Tears trickled down my face as I knelt in silence. In the stillness, you can hear from the CREATOR if you pause long enough to listen. This is what I heard in my solitude as it repeated over and over in my mind. I stood up a different person than when I knelt. This was something I had to do. If I truly believed everything from the last three years of my life was GOD's handiwork, then so was the fact that I was standing in a wedding dress store with the dress that I knew beyond a shadow of a doubt was the one I was supposed to wear walking down the aisle to meet my groom. When I came back out, Jerrie looked at me with a glimmer of hope and said, "Well, what did HE say?" I responded, "Whatsoever is not of faith is sin. If we really believe that Earl is going to marry me, then I need to buy this dress today." "Okay then...do it," she said. For Jerrie, this was quite possibly the biggest leap of faith aside from salvation she's ever taken. She is such a precious, loving spirit. She wholeheartedly loves JESUS, but she's also a very practical person that looks at what is right in front of her. So for her to be by my side and urging me to do this was truly monumental. As I checked out and paid the deposit on the dress, (which I would be making payments on over the next 4 months to get it paid off!) they asked when I needed the dress by. Jerrie and I glanced at each other and quickly I blurted out, "September...the 7th." I hadn't been prepared for that question, so the first date that came to mind came out. My birthday. After all, who wouldn't want a beautiful wedding dress for the birthday? And perhaps by then Earl and I would be engaged. Only the LORD knew.